A Seamless and Beautiful Smile Awaits! When was the last time you felt confident smiling even though you were missing a tooth or struggling to keep a denture in your mouth? Instead, you could be taking advantage of an advanced solution like dental implants! This restorative treatment is meant to provide results unlike any other tooth replacement option. With them, you’ll be able to eat, speak, and smile with confidence once again! By seeing a team of prosthodontists and implant dentists for your future dental implant, you’re sure to gain a new smile that looks incredible and functions beautifully for decades! Get in touch with a dentist in University Park today to get started! 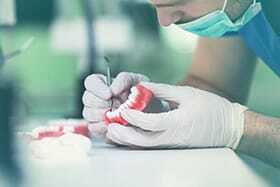 It truly doesn’t matter how many teeth you are missing; dental implants have the ability to replace teeth whether you’re missing your first permanent tooth or have been wearing dentures for a while now. Once your implant has fully integrated with your existing jawbone, you can expect better oral and overall health for many years to come! Bone tissue will no longer continue to resorb back into the body if it’s being stimulated by a prosthetic root, which is exactly what implants are designed to do. Create the most natural-looking smile possible! With proper care, dental implants tend to last anywhere between 25 years and a lifetime. This is largely because of the natural integration that occurs between the titanium root and your mouth’s bone and gum tissue. Dental implants are ideal for those who may have been previously considering a traditional bridge or denture to replace their teeth. Take a moment to learn how our team creates your new smile powered by dental implants! With the help of a single titanium implant and porcelain crown, we can fill the gap in your smile. Our office uses porcelain because of it’s incredibly similar qualities to natural tooth enamel. The best way to replace multiple consecutive teeth is via a dental bridge retained with implants. Instead of removing enamel from neighboring teeth to anchor the bridge, an implant is placed on either side of the gap. 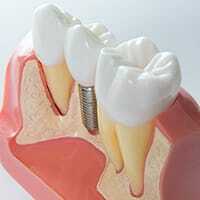 In most cases, two implants are sufficient to hold a restoration consisting of two or more crowns. Need to replace a full arch of teeth? Dentures can be custom-made to snap onto four to six strategically placed implants throughout the mouth. The denture can also be made to be either fixed or removable, depending on your preferences. 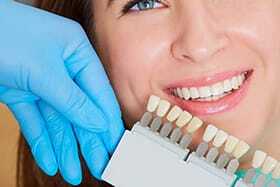 Dental implants are considered to be an investment unlike any other form of tooth replacement. This is because not only do they typically last the longest, but they function more naturally than any other option and do not require nearly as much maintenance. In the long-term, this results in lower costs compared to more traditional methods.